I'm Andrew. My goal is to turn your ideas into digital form. 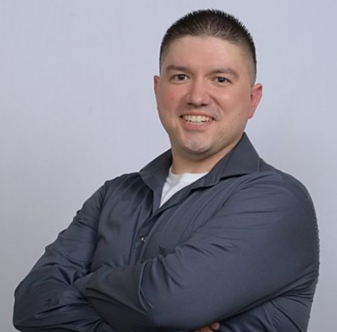 If you need a website, app, or help with improving your current online presence, I’m your guy. Let’s talk! Before someone visits you, they will often research you and visit your website first. Would you like a website that puts your best foot forward AND serves as your 24/7 sales & marketing rep that never sleeps? Go ahead and click on LEARN MORE to get started! I actually specialize in building WordPress websites since you don't need any coding skills to make changes. What is WordPress? It's open source (free) software that makes it easy to create, update, and maintain your own blog or website. After I finish the WordPress website and deliver it to you, I even create video tutorials so that you'll have all the guidance you need to make updates to your website. Are you looking to get a website, logo, and other branding elements to help you really put your best foot forward? I have some sweet "done for you" package deals you will not find anywhere else. Each package includes a WordPress website with the Divi theme installed. In a nutshell, this means I can build your website faster and give you the ability to make changes to your website in real time. You also get 3 months of complimentary web care with each package. When you invest in a website, you have a lot more than just a link to put on your business card or social media profile. You have something that serves as your 24/7 sales & marketing rep and generates leads/sales even while you sleep. If your website isn't yielding the results you want, I will make myself available and help you make a game plan to get your website (and business) where you'd like it to be. I offer three different tiers of website care plans. You can pay monthly or annually. When you pay annually, you'll get three months free. Go ahead and click LEARN MORE below to see what I have to offer. After you get your WordPress website established, you have to keep in mind hosting, backups, cybersecurity, etc. How would you like a dedicated techie to keep your website in top shape AND be available to discuss online strategy via Skype or email? Go ahead and click on LEARN MORE to get started! Thinking about a mobile app for your business? I can help you go mobile and reach Android and iOS users. I have the resources in place to create a mobile or web app for you. Go ahead and click LEARN MORE to get started! Want an app made just for iOS or just for Android? Depending on your goals, it's often best to create an app for a specific operating system (such as the ability to make phone calls within the app). Are you more interested in your mobile presence being more of an extension of your online presence? If you don't need anything too complex, then a hybrid app can be a great solution. Although hybrid apps are created to work with any operating system, just keep in mind that it might not display as well as a native app. After getting your app finished and ready to go, we can take care of submitting it to the app store. We can also handle marketing your app and taking care of any bugs that might arise. I can write well researched content for your blog, email newsletter, or social media account. Just let me know your keywords and main ideas to cover. Dealing with bugs or glitches on your website? Whether it's a WordPress website or other type of website, I can put my tech savvy abilities to work and get the issue resolved. Do you have multiple tasks you need help with? Then you'll enjoy my blocks of virtual assistance hours for you. When you invest in a block of time, the hours never expire. Go ahead and click LEARN MORE below to see what kind of tasks I'm about to assist you with. Do you have so much to do but not enough time to do it? I can assist with a number of online tasks such as content creation and website bug troubleshooting. 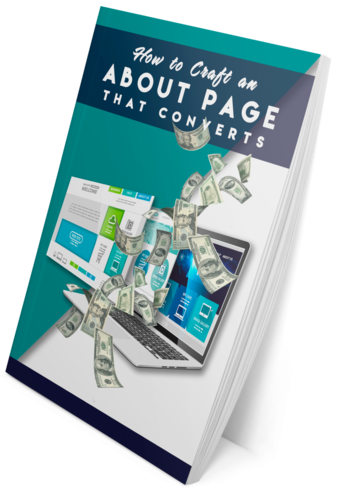 Go ahead and click LEARN MORE to get started! This is actually the very first website I created. 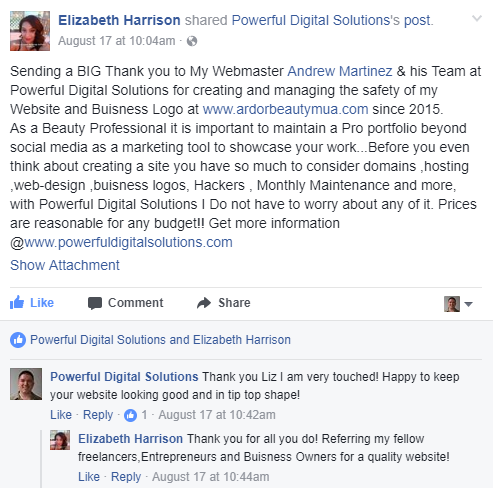 As Liz’s (the owner) freelance business has grown over the years, I have helped keep her portfolio updated and website overall in tip top shape. 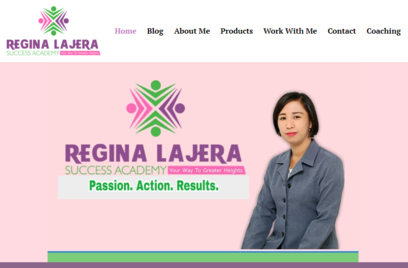 I met Regina in an entrepreneurial Facebook group. She mentioned she was starting her own coaching business. 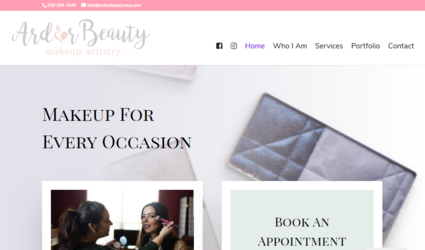 Long story short: she hired me to build her website, and I continually help her tweak her online strategy. Hello and thank you for visiting! I’m Andrew and I’ve been building websites since 2012. If you’re at least considering a new website, new app, or optimizing a current website, you’re in the right place! 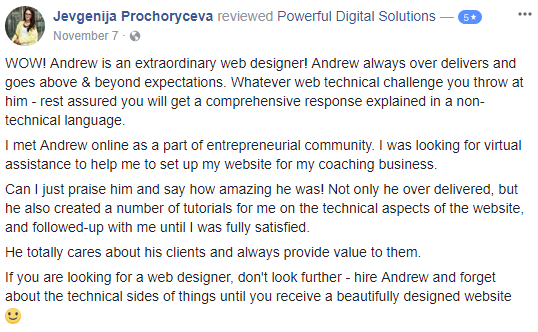 My testimonial video for Andrew at Powerful Digital Solutions. Ready to Turn Your Ideas Into Digital Form? The very first step is to send me a project application so that I can better get to know you and your goals. Click the button below to get started! "Turning your ideas into digital form"
REFERRAL PROGRAM: if you refer someone to me and the interaction results in a paying client, you get a 10% referral fee!